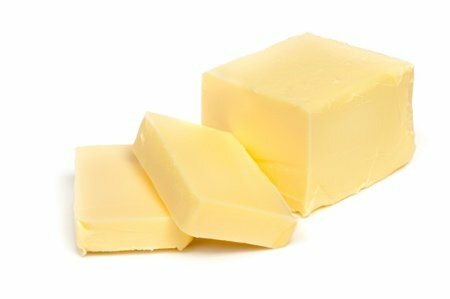 Ahhhh, look at that beautiful butter. I can’t wait to smear it all over my steak. lose more body fat and have a lower chance of heart disease THAN people who follow a low-fat diet. Even more exciting, was that the researchers did not make the 150 participants cut calories. It shows that in a free-living setting, cutting your carbs helps you lose weight without focusing on calories. And that’s really important because someone can change what they eat more easily than trying to cut down on their calories. I love the idea of a “free-living setting”. Is that where I live now where my children run around naked from time to time? The “carb cutting fat eaters” lost an average of eight pounds more than the low-fat group, lost body fat, and had improvements in their lean muscle mass AND they didn’t exercise more. How about that? I know what you are wondering. What did they eat? Was it flank steak dipped in butter with a side of cream? A typical day might consist of eggs for breakfast, tuna salad for lunch, and some kind of protein for dinner — like red meat, chicken, fish, pork or tofu — along with vegetables. Low-carb participants were encouraged to cook with olive and canola oils, but butter was allowed, too…. The majority of their fat intake, however, was unsaturated fats. Bummer. No steak dipped in butter. I think many of us have noticed that when we cut our carbohydrates we lose belly fat and weight. No French fries, bread baskets, cereal for breakfast, massive sandwiches for lunch, and thick crust pizza for dinner. But, the nice thing about the study is that the idea that “Fat makes you fat” is outdated. Also, even though the participants ate more saturated fat (meat fat) than is recommended – they didn’t increase their bad cholesterol levels. My conclusion is put down the cookie and pick up some nuts. What do you think of the new findings? Thank you for talking about this study. So many studies say carbs when they mean bread and rice and potatoes. Did they reduce their intake of peaches (gasp!) and tomatoes and watermelon also? Sounds like avocados might be back?? Ok. I was thinking about gastric bypass surgery but the thought of such a major surgery is not sitting well with me. I am trying to do it on my own with no luck so I just wanted to know more about carbs. If you're trying to cut down on them is the bread,rice and potatoes the things to avoid or is there more foods to that list and if so what are they? I know it seems like a crazy question but I'm the type of person who needs a list. Thanks. Any help is greatly appreciated. Perhaps a better phrase to use is 'avoid the starches'. Vegetables and fruit are also carbs, but one should never cut those out. Cutting out starches immediately eliminates a lot of processed sugary foods, and wheat, so yes, one will lose weight! Bonus! Hi Kim! I completely understand needing a list. We all need some structure when it comes to weight loss. I'm a list person myself. I highly recommend looking into Weight Watchers. I did it and lost 60lbs. I have all also maintained my weight for almost 7 years. It is really helpful because they give you a list of foods when you start so you know what are some good choices. And the great thing is that you can still have chocolate, wine, etc but they teach you about portion. The first couple weeks it's called Simple Start where you don't have to measure or weigh anything. It's all about eating the proper foods. I highly recommend it. Just want to say, I love this. You're helping America eat right. I have been doing the low-carb eating since May and I have lost 31 pounds. I also do 50 minutes of water aerobics, 3 days a week. Lean protein(not much red meat) and non-starchy veggies along with some heart healthy nuts has helped me shed the weight! People in the 'heal yourself with food' movement have known this for decades - it is awesomely encouraging to see this getting mainstream attention!! I just want to know - A sandwich fills me at lunch...What do you substitute for no bread or cereal. Cereal is very convenient for me as I eat at work! Oatmeal too! Moderation....moderation...moderation. We usually get into trouble when we forget this. The site MyFitnessPal.com (it's free) lets you input your foods eaten & amounts each day, then shows you the amount of protein, fiber, carbohydrate, etc (you choose what to see) in each thing you ate. Also you can just look up specific foods on their gigantic food database. To Kim (above in comments), a site like this will show you which fruits & veggies have more carbs and according to my doctor those who really need to lose weight can opt to cut out not just bread & pasta, but also the highest-carb (aka starch) veggies, such as corn. Finally ! I and others on this blog have been saying this for quite a long time. This is not a revelation. Vegetables and fruit contain fiber and needed vitamins and minerals and many are low in sugars but whole foods, not processed are the way to go. The best fruits, by the way, are berries. They are lowest in sugars and high in phytonutrients and antioxidants. Fresh or frozen are fine. Juice not as helpful. Juice bought at the grocers is often full of sugar and no fiber. The sugars go straight to the blood stream causing the blood sugar to spike and then crash later because there is no fiber to slow the digestion. If proteins are eaten at breakfast, we are less likely to be really hungry the rest of the day. Also, when we went to coconut oil and butter, we lost weight and hubby's cholesterol went down. What an uplifting post. Seems anytime I read about a new study it depresses me because I find out what I've been doing isn't healthy or "right". It is very refreshing to read & learn about something you CAN do instead of you can't. Although I'm just a busy mom with a hectic life I've learned through my own research (I'm the research subject of course) that instead denying myself something I do my best to keep things in moderation. Since I've had my daughter I have become super aware of the impact of negative words. Can't, don't are words we try extremely hard not use around her especially when it comes to weight, self image & self esteem. Society continues to push the super skinny = beauty, happiness & success equation on us. Instead we try to teach our 7 yr old lady that beauty, happiness, success & so many other things are not based on being skinny but by being healthy & embracing your differences, as well as others. Personally I am much more inclined to follow a healthy lifestyle if I hear or read positive words. Thank you for posting this new positive study. It does make sense, but I'm wondering about the cereal. I eat healthy cereal in the morning. Oat meal, whole grain cereal and I have 3/4 to 1 cup a day with skim milk. I'm not a bread eater. So I'm wondering about that? I enjoyed this post so much and do a lot of my own research on food and diets, and what is and isn't healthy. I have tried WW several times and applaud them on their approach and balance of their food menu's. Unfortunately for me, I appear to have a horrible addiction to processed foods, especially "junk" foods and do not appear able to moderate, or have just a little. I am also a recovering alcoholic, and if you look at what helps to ferment alcohol, it is our old friend (not!) sugar. I have to wonder if my preference towards all the multi layered tastes of junk food does not also enter in to the addiction to alcohol. Junk food is layered to make it irresistible, i.e. fried ingredients that are generally just large, varying amounts of sugar and salt, and totally unhealthy amounts of fat. And of course all the lovely preservatives. I have to admit they hook me in. That being said, I notice that going low carb places the sugar addiction in check, as you are staying away from foods that are high in sugar, yes even some fruit, but we'll get back to that in a moment. Without the continuous spike of glucose or sugar in your blood stream, you are able to have a normalized blood sugar, without spikes and then drops, and are able to feel better, and eat more sanely, more healthy, and more efficiently for your body. As far as the high sugar or starchy vegetables and fruits, inially you should avoid them. As you progress with low carb eating, you can add them back, but just in smaller portions. A 1/4 of an apple instead of a whole apple at a meal or snack, same with all the other high glycemic index foods, not banish them, but eat them in much smaller servings so that all the sugar in them doesn't make a spike in your blood sugar. That spike is what causes the horrible need to keep eating, as after the blood sugar spike starts dropping down, you start feeling maybe weak, maybe light headed, or just like you want to eat something sweet. When you do you cause another spike which results in the previous scenario playing out, over and over again. Anyway, you can find lots of great information out there on low carb eating. And...healthy fat is definitely your friend. Interestingly enough, the "low carb" group that started off at a pretty sever restriction of 40g of carb per day (equivalent to 2, 1/2c servings of fruit and 1 cup of cooked vegetables) was by the end of the study was consuming about 1/3 of their calories from carb (~127g/day). They were also educated on heart healthy fats and even plant based proteins, etc. The diet that will work is the one that is sustainable for YOU. I personally could not live without my whole grains and am not willing to severely restrict my intake of carbs. There has to be a balance that is livable. The more important thing is to look at the quality of your diet, and develop a healthy relationship with what you eat and how you move. In short, people need a eating habits (ie. a'diet') that they can sustain; the proportion of fat:carbs will vary from person to person. For Cathy - That sounds great but I like to follow the science. As science advances, so do findings. It is a proven fact that carbs stick to our cells and this is how our A1C test is determined as diabetics. A1C tells us how the body is metabolizing carbs and how the pancreas is or is not releasing enough insulin. Having this info helps us to know if we need medication and/or insulin. Overeating and excessive carb intake as well as other factors, destroy beta cells residing in the pancreas which produces insulin. "Chronic exposure to elevated levels of glucose and free fatty acids (FFAs) causes β-cell dysfunction and may induce β-cell apoptosis in type 2 diabetes." If reading this scientific paper does not convince you, I have other resources. The causes of beta cell death vary from Type 1 diabetes and Type 2. Scientists are finding out that there may be even more subtypes in defining this autoimmune disease. Also, something to think about that I have take steps to reverse, is that diabetics are mostly all magnesium deficient. Magnesium is responsible for helping the body metabolize glucose as well as assisting in over 300 biological processes. If our blood sugar gets to low the body shuts down and that may mean cardiac arrest. If it gets to high, we could go into a coma. I will spare you details on the other scary aspects of diabetes. Now what do you think about carbs?